Knowing where to get worms and the right kind will make all the difference in the world when starting a successful worm farm. Most of you are beginners and if you're not wanting to buy composting worms then you're a little more frugal and you're wanting to know where to find worms for your new worm farm. Worms are all around us and on every continent. If you are the frugal type and are very patient then your backyard may be where to get worms. Let me be clear. This is the least recommended way in my opinion. Depending on where you live in the world, you are not guaranteed to find a composting worm for your worm farm. So if you'd like to take this route it will be slow and a gamble but also very educating and fun too. I would suggest looking under rocks and logs but more so on a farm or pasture where there are rich deposits and piles of manure. Just tell the farmer that you are starting a worm farm and you'd like to collect some worms. make sure to take some manure with you as well. You can also start a compost pile outside by adding a lot of leaves, grass, straw, hay, manure, fruits and vegetables. Worms will eventually make their way to the pile where you can collect them. If you know someone who already has a garden with compost piles, then ask them if you can take a look around and "borrow" some of their worms. Make sure to NOT use any worm that's big, long and fat like a nightcrawler. These are not composting worms but soil dwellers. They grab their food and take it back down into their burrows. Composting worms are generally smaller. Red wigglers are long (4" or so) and spindly and much smaller than your average nightcrawler used for fishing or the kinds found after a rain storm. After you're done collecting you will not know what types of worms you have until you put them in your worm bin, feed them and wait, wait, and wait. If they start to thrive and populate in a homemade worm bin then, Congratulations! You probably have a composting worm. But what type of composting worm is it? I can't tell you that but here's a link that may help you to identify the species in your worm bin system. Worms From the "Bait Shop"
There is an easier way in your "where to get worms" quest and that is, your local friendly bait shop. I don't want to step on any toes of those that own bait shops. I'm just looking out for the readers here at WFR. So bear with me. If the dealer cant't tell you the scientific name of the worm then I would advise that you do not get any worms from that dealer. Anyone can call a worm any name. It really is difficult, to the untrained eye, to know if you have a composting worm or not. That's why you want to buy from a reputable dealer in composting worms with their scientific names and a good proven track record. Another thing I want to stress is the stress of the worms. These worms are kept in the cold in small jars or containers without food. This does not harm the worms but it does cause them to stop productivity. 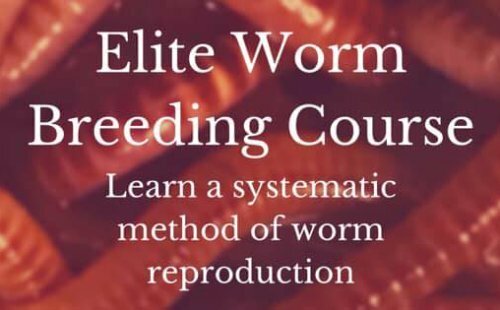 Depending on your goals or your situation, you may want your worms ready to get to work almost the minute they're introduced into the worm bin. This will help maximize your productivity in castings and worms from the start. Make sure they can tell you the scientific name before you "take the bait". Do you want to know where to get worms that are already dumb, fat and happy? That's right! Another worm farmer. Along with happy worms that are ready to start working, eating and turning out great worm castings is the fact that you can probably get them for FREE. I have given several of my little friends away for free to many people that wanted to have happier and healthier plants. Just ask them if you can barrow a few or a lot (depending on how many they have) and you'll be happy to replace them. This is, without a doubt, the best in knowing where to get worms for your worm composting farm. Getting from an online dealer (like me) is the most common way in not only where to get worms but where to find worms. You may want a different type of composting worm that your friends, a bait shop or the great outdoors can't offer you. You may want a good composting worm but also a good fishing worm as well. That would be the European Nightcrawler (Eisenia Hortensis). You might want the all-around best composting worm ever, the red wiggler (Eisenia Fedita). So where to get worms or where to find worms is a really great question and one not to be taken lightly. This decision could impede, destroy, or greatly increase the productivity and population of your worm farm.